Plastic Pipes and Fittings are used in varied purposes such as the transfer of drinking water, sewage, chemicals, waste water, heating and cooling fluids, ultrapure liquids, gases, slurries, vacuum air systems and compressed air, etc. 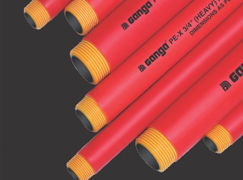 Generally Plastic Pipe Systems consist of Pipes, valves, Fittings and accessories. The size of the Pipe Systems may vary according to their usage. Pipes, valves and fittings are molded and therefore they come in different shapes and sizes. Backing rings, clips and gaskets are the accessories generally used with Plastic Pipes and Ips Threaded Pipe Fittings . The essential steps of Pipes And Fittings production are heating, melting, mixing and molding the material into a particular shape and finally holding that shape during the cooling process. These steps are necessary not only for solid wall Pipes but also for injection Molded and compression Fittings. Two major processes used in manufacturing of Pipes And Fittings are extrusion for Pipes and Injection Molding For Fittings. Given below is the production process of Plastic Pipes by Extrusion Molding. Material Handling - The raw material compounds are delivered as non-pigmented pellets. They require processing aids and stabilizers for heat and UV protection. Blending and formulation are critical stages of this process. Color pigment is blended to the compound. Compounds are usually a blend of color concentrates and natural resins. Feed to the extrusion or Molding machines can be direct or in the form of pre- processed granules or dry blend. Extrusion - The basic purpose of extrusion is to heat, melt, mix and convey the raw material to the die for the formation of a particular shape. The mixing temperature is around 120� C which is achieved by frictional heat. The extruder is basically a complex device, a zoned and temperature controlled barrel in which precision screws rotate. The material is subjected to heat, pressure and shear which are highly dependent on the screw speed, barrel temperature and screw design. Sizing and cooling - After the pipe leaves the extrusion die. It is passed through precise sizing sleeves. The pipe is pulled by a haul-off or puller through cooling and sizing operations. Speed is an important aspect as it affects the thickness of the finished product.